and I just can’t hide it!!!!!! Rose Bowl here we come!!!!! Seriously that game was beyond amazing. At times it felt like an out of body experience. And if Mark Ingram does not win the Heisman after his incredible game then there is something inherently wrong with the system. He has been “the man” all season long. Alabama is going to the Rose Bowl because when Greg McElroy forgot how to play football, Mark Ingram stepped up and carried the Tide offense to victories. Thankfully McElroy remembered his winning ways and came through for the Tide big time. It started that last drive of the Auburn game last week and continued tonight. 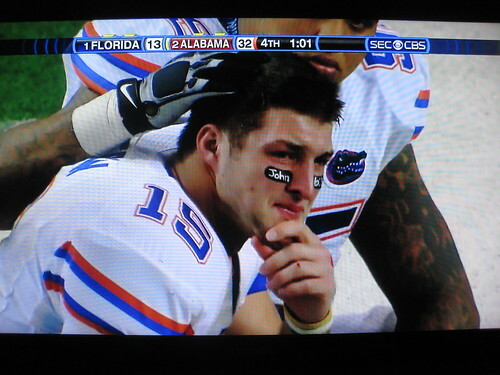 All those people who said they’d rather have Tim Tebow as a quarterback now have this as their lasting image. If Alabama winning and going to the BCS title game was not enough- watching Timmay cry on the sidelines was the frosting on the cake. So now Alabama goes on to face Texas. I’m happy/sad that I’m not going to be in St. Louis for the championship game. My dad and brother are huge Longhorn fans. Huge. Rest assured my mom is really happy I’m not going to be there. We haven’t been known to really “play nice” in the past. If there is nothing else that my dad, brother, and I have in common it is fierce competitiveness with a hint of sore loser mixed in. Oh and there is plenty of cursing. As my mom puts it “very undeaconlike language”- but she has very little room to talk. Of course if Texas loses she has to deal with my dad and brother pouting. Better get prepared for that mom- Texas is going down! This entry was posted in Uncategorized and tagged Alabama football, BCS title, I love to see Florida lose, Roll Tide, Rose Bowl, Tebow is a big crybaby. Bookmark the permalink. Awesome .. very stunning subject. I am goin to blog about it as well. Too bad you can’t come out to see the Rose Bowl in person… with a little 606 to boot!